Cognitive Illusions　explores a wide range of fascinating psychological effects in the way we think, judge and remember in our everyday lives. 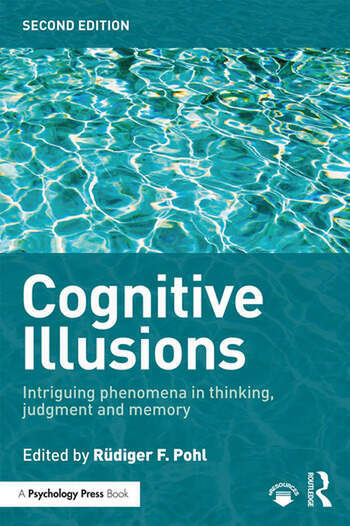 Featuring contributions from leading researchers, the book defines what cognitive illusions are and discusses their theoretical status: are such illusions proof for a faulty human information-processing system, or do they only represent by-products of otherwise adaptive cognitive mechanisms? Throughout the book, background to phenomena such as illusions of control, overconfidence and hindsight bias are discussed, before considering the respective empirical research, potential explanations of the phenomenon, and relevant applied perspectives. Each chapter also features the detailed description of an experiment that can be used as classroom demonstration. Featuring six new chapters, this edition has been thoroughly updated throughout to reflect recent research and changes of focus within the field. This book will be of interest to students and researchers of cognitive illusions, specifically, those focusing on thinking, reasoning, decision-making and memory. Rüdiger F Pohl is Professor of Psychology at the University of Mannheim, Germany. His research interests include cognitive illusions, heuristics and decision making, and autobiographical memory.